2007 Monterey 180 FS with 55 – 65 hrs. 4.3L 190 HP Mercury engine. 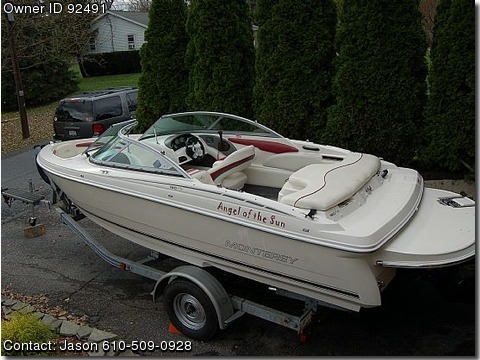 Boat is in excellent condition, only used in fresh water lake ( Lake Wallenpaupack in the Poconos) White with burgandy accents. Kenwood am/fm cd player with sirius sat. radio. Storage locker for skis, ect. Plenty of storage under seats. Has front and cockpit covers, bimini top, custom trailerable/winter cover included. Boat is 18' in length, had swim platform installed making it 20' in length. Coastguard package, anchor and rope. Hydrofoil added to outdrive for performance. Rides on a loadrite trailer. Trailer has good tires, new rollers and hardware installed in 2009. Battery always charged for long life.